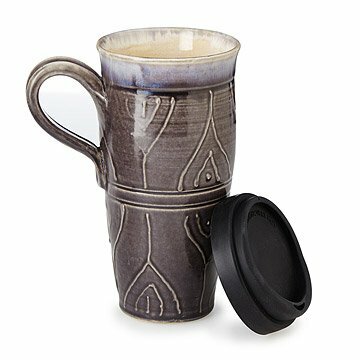 Enjoy your favorite beverage in this stoneware travel mug that brings functional, handmade beauty to your daily routine. Handmade by Sarah Welch, they"re an eco-friendly alternative to disposable paper or plastic, hold 24 oz. of liquid, and fit in standard car cup holders. Each one-of-a-kind mug is hand-decorated and glazed, and their stoneware handles keep your fingers cool when drinking hot beverages. Great gifts for anyone on the go, they"re microwave and dishwasher safe. Handmade in Jaroso, Colorado. Sarah Welch was first introduced to ceramics through a year long apprenticeship with a traditional master potter in Vienna, Austria. After studying art in Austria and California, she earned a BFA in ceramics/sculpture. Since graduating she has shown her sculptural and functional work both nationally and internationally. Sarah enjoys making pottery, where she finds the fusing of beauty with function an inspiring challenge. The long tradition of pottery and its intimate place in daily life inform the artistic choices she makes. Hand wash silicone lid. The mug is microwave and dishwasher safe. I like my large mugs to have wide enough handles to get 3 or 4 fingers in to balance the weight of the mug. This mug only allows 2 fingers. Which makes it awkward. It would have been perfect if the handle had been wider. I needed something different for office use but not a typical coffee mug. This fit the bill perfectly. It was a great gift for my boss. I love this mug! It holds lots of coffee, fits in my car cup holder and is beautiful. I bought one last year, and my son broke it a few weeks ago. I immediately ordered another one. Highly recommended! I love this mug. The quality is amazing, it's heavy duty and hold a LOT! It has quickly become my favorite mug. The mug is beautifully made, and I love that it isn't plastic or metal and is microwave and dishwasher safe. However, the base is narrow (to fit in cupholders)and the mug is a bit top heavy, as I found out when I knocked it over and broke the handle off about 2 seconds after it arrived. My own clumsiness aside, I continue to use it sans handle but the mug itself gets too hot to hold with bare hands (or between your knees as you drive!). With a couple improvements this would be a GREAT product. Beautiful mug whether used for travel or not. This handmade stoneware travel mug is an eco-friendly way to take your coffee to-go.